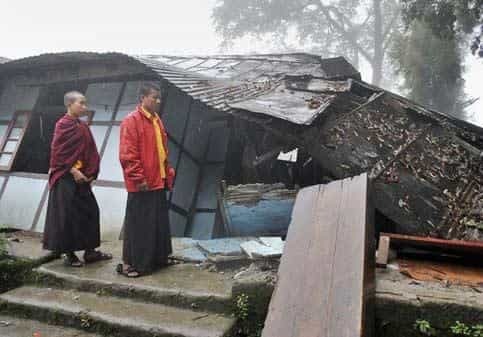 New Delhi: Sunday’s 6.8 magnitude earthquake on the Sikkim-Nepal border has wreaked havoc in the Himalayan country and the north- east Indian state, but scientists say the likelihood of a much greater earthquake in north India remains. Despite a decade-long upgrade of seismic monitoring instruments, scientists say their data is insufficient to be able to predict quakes anytime this decade. “Technically, this is classified as a moderate quake (with a magnitude less than 7); however a great quake (above 7.5 on the Richter is imminent in this region. Unfortunately, we can’t predict when," said Ajit Tyagi, director general, India Meteorological Department. The conviction of seismologists that a major quake is imminent in the region rests largely on historical precedent. Between 1897 and 1950, India saw five devastating earthquakes between and 7.9 and 8.5 on the Richter scale and the subsequent 60 years haven’t seen anything on a comparable basis. Scientists infer that this is too long a time without a temblor of significant size in the region. Sikkim as well as most of north India falls in zones 4 and 5, regions classified as highly vulnerable to high intensity quakes. Most of north India lies along a zone called the Main Central Thrust Zone, a region that spans the Himalayas and extends well into Pakistan. It’s on this zone that the tectonic plates that support India collide with the ones that bear Europe. The collision between these two plates leads to great instability, that, according to scientists, greatly increases the chances of frequent, major earthquakes. 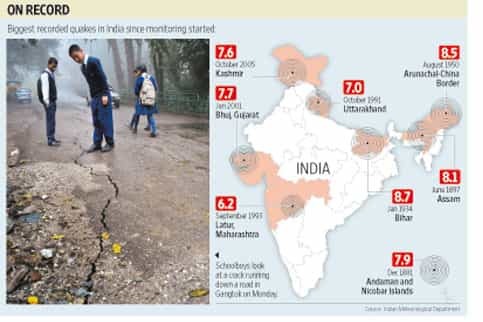 Even though India doesn’t see as many significant earthquakes as parts of the US or Japan, it has lost several thousand lives to earthquakes in the 20th century, mostly because of the absence of resilient infrastructure. Gupta said it was far easier to put in place plans to prepare for a quake than being able to predict one anytime soon. “We do know the speed at which the Indian plate is crashing into the Eurasian plate thanks to better monitoring facilities, but that’s still not enough to make predictions," Gupta said. “There’s a lot, however, that can be done to restrict damage."